The Staples Center in L.A. is home to the Lakers, Kings, and a number of other teams. It’s also where the championship finals for League of Legends are being held this year. Even though the game plays out on a digital map stored in cyberspace, the organizers behind the event clearly felt the teams needed to be playing on a stage that would properly communicate how epic ten people frantically clicking their mouses in front of computer screens could be. 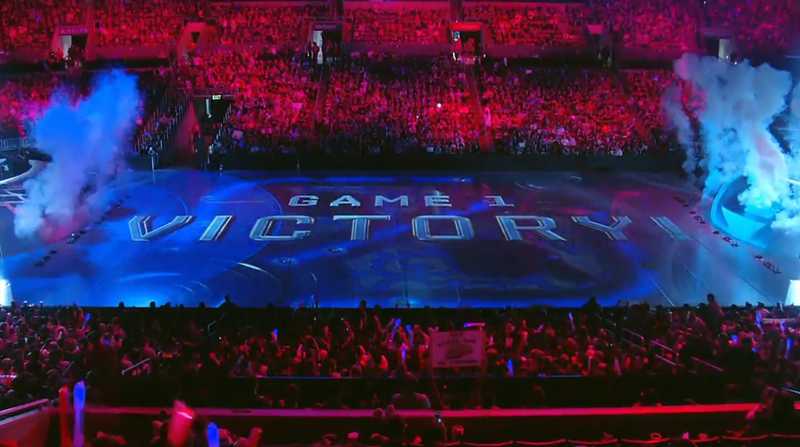 As you can see from the above image, teams are located at opposite ends of the arena, separated by massive projections that reflect what’s going on in the game, like who’s winning and who’s dying. Currently, the series between SK Telecom T1 and Samsung Gaming sits two games in the former’s favor. SKT was always favored to win, but game two was quick enough to make it look like things are going to easy for the former world champions. SSG will have one last chance to try and pull something out, with a third game going to SKT spelling an end to the best-of-five series. But whether you’re an SKT fan excited for them to make League history by winning a third Worlds, or in SSG’s corner nervously chewing through your face, we can all come together in appreciating the completely ludicrous digital excess of esport pageantry.